Miami Club welcomes USA Players and is owned by a large Dutch company running many casinos. Behind this operation is a talented team of casino managers that have joined forces. They have created this new sensation in online gaming! The casino is open to players from most countries except the UK and Canada. One of the exciting features here at Miami Club is that all players are automatically enrolled to the basic tier of VIP membership after their initial deposit. This VIP then makes them eligible to receive extra bonuses and prizes every month. This will also include the likes of match bonuses, reloads, and free coupons. Each time you deposit you will receive Comp Points which you can then redeem for real cash. Obviously there are the usual Terms and Conditions that apply, so we urge you to go through them so as not to be disappointed. Miami Club Casino offer an easy on the pocket Bonus which takes you over 8 individual deposits. They will give you a 100% match bonus up to $100 on you each of your first 8 deposits. Thereafter there are a number of bonuses that you will be eligible for. You will be automatically enrolled into their Club. They offer possibly the most competitive program in the industry to reward your loyalty. The Loyalty program has 6 levels that you can reach. The more you play, the higher up the ladder you go. You eventually reach the top rung and the ultimate level in Comps. Miami Club is powered by WGS Technology software which has been operating in the gaming business for over a decade and was first under the guise of firstly Odds On Technology, then more recently Vegas Technology. Although the name has changed, the games have not and you can find all your favourite games that you would have enjoyed if you are a player who visited one of the several casinos that have offered these games in the past. WGS Technology Software’s particular strength has always been the tournaments system that they run which offers a wide choice of tournaments that use a format that is a little different from most others you may have tried. Miami Club Casino Tournaments – Be a winner! In terms of the games at Miami Club Casino, their choice of WGS Technology offers a smooth, speedy experience that generally loads and plays quite well. The artwork on most of the games are fairly simple. However this is compensated for by games that load near instantly once downloaded the first time and that will run on years old computer hardware which ultimately gives you a smooth gaming experience. Miami Club online Casino on the move is available on all Windows, Apple and Android devices, phones and tablets. Miami Club online mobile casino is browser based so there is no app to download. You do not need to register a second account to enjoy the Miami Club casino on mobile as you can connect with your existing login details. If you are of course a new player to the Casino you can register directly on your mobile device. 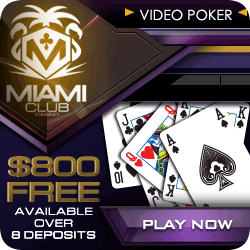 Miami Club mobile like the online casino also offers unlimited free money play on all mobile casino games including three-reel and five-reel slot games, all video-poker games, Blackjack and Roulette. Play for free with no registration or sign-up required! Just click on any game icon and follow the play for free prompts. Free play is not available on any progressive jackpot component. 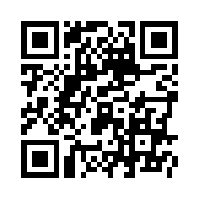 If you want to go to the mobile casino feel free to scan the QR Code below and be magically whisked directly to the mobile casino!